The University of Illinois Wind Symphony and Chamber Singers premiered a new composition – written to celebrate the U. of I.’s sesquicentennial – at Symphony Center in Chicago in February. “Gathering” will be performed in April at New York City’s Lincoln Center for the Performing Arts and at Urbana’s Krannert Center for the Performing Arts. 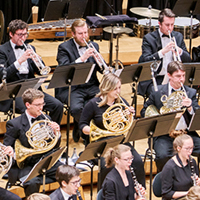 CHAMPAIGN, Ill. — Two distinguished music ensembles of the University of Illinois are performing a new piece of music written to celebrate the U. of I.’s sesquicentennial and its legacy as a land-grant institution. In a rare collaboration, the U. of I. 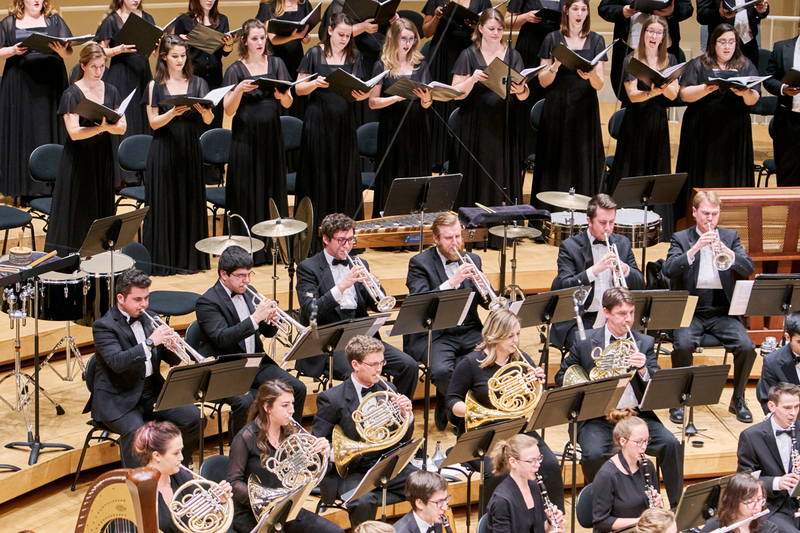 Wind Symphony and Chamber Singers are performing “Gathering,” a series of concerts featuring the newly commissioned work of the same title, along with several other pieces of music. 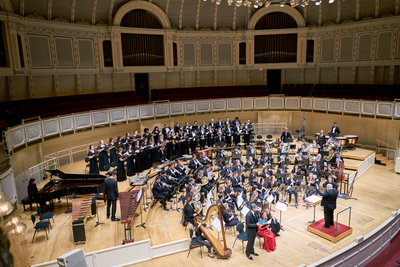 The ensembles premiered the new piece at a February concert at Chicago Symphony Center. They’ll perform it April 14 at New York City’s Lincoln Center for the Performing Arts and April 21 on campus at Krannert Center for the Performing Arts. 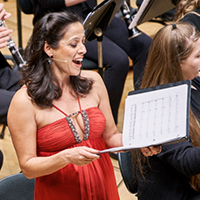 The 20-minute composition was written by Dominick DiOrio, a composer and a professor of music at Indiana University. The libretto was created by National Book Award-winning author Richard Powers, a U. of I. professor emeritus of English. Wind Symphony conductor and director of bands Stephen Peterson and Chamber Singers conductor and director of choral activities Andrew Megill proposed the collaboration of their two ensembles. Baritone Nathan Gunn and soprano Yvonne Redman, both opera singers on the U. of I. School of Music faculty, sang the solo parts at Chicago’s “Gathering” concert. Robert Todd Payne, an Illinois alumnus and a music professor at Missouri State University, will sing the baritone solos at the April concerts. They envisioned a newly commissioned work that would be performed at multiple venues, with “text as closely suited to our needs as possible without being too Illinois-centric, so other bands and choirs would be interested in performing it,” Megill said. He suggested Powers, one of his favorite authors whose novels include musical themes, for the libretto. Powers is an amateur musician and composer who studied cello at the U. of I. “I wanted a text that represented Illinois’ traditional strengths in engineering and in science, and I also wanted to represent the humanities and the arts, the liberal arts combined with the traditional purpose of a land-grant university that presented a broad vision of education in all disciplines,” Powers said. In selecting the words from a few of the many U. of I. alumni, “I was looking for people who had left their mark on the world, who were revered figures in the history of the university, and people who themselves believed in the transformative power of education,” he said. He also sought to highlight a diverse group. The three people he chose are: Pulitzer Prize-winning poet Mark Van Doren, a Christian farm boy who became an influential poet and teacher; Nobel laureate in physiology/medicine Rosalyn Yalow, a Jewish medical physicist from New York who broke barriers for women in science; and pioneering architect and engineer Fazlur Khan, a Muslim raised in what is now Bangladesh whose innovations in high-rise building construction included the system for building Chicago’s Sears (now Willis) Tower. Powers used the Van Doren poem “Slowly, Slowly Wisdom Gathers” as the backbone of the libretto, returning to the stanzas of the poem to tie together the words of Khan and Yalow. He used part of Yalow’s Nobel speech in which she talks about the lack of opportunities for women in scientific and leadership roles, and placing hope in the next generation. He used words from Khan in which the engineer described putting himself in the place of the building in order to feel the stresses and imagine a way to counteract them. Powers envisioned a specific structure for the piece, with a soprano soloist singing Yalow’s words and a baritone singing Khan’s words. “I tried to set it up almost as a cantata, with interplay between the soloists and the chorus,” Powers said. “Richard had the shape of the piece, with the music rising and falling and text written around it. There’s a beautiful symmetry to it,” DiOrio said. The libretto for “Gathering” was created by National Book Award-winning author Richard Powers, a U. of I. professor emeritus of English, using the words of three renowned U. of I. alumni. Dominick DiOrio, a composer and a professor of music at Indiana University, wrote the music. DiOrio was chosen to write the music that would be paired with Powers’ text. His concept for the piece was an image of something starting as a seed and growing to multiple areas of expertise. He began the music with one saxophone, then other saxophones joining in, and then the chorus members. It’s a microcosm of the piece, he said. “There’s a moment when the music stops and the chorus is singing in low register. That music repeats a little while later and the band members sing along. You get a representation of everyone taking part,” DiOrio said. 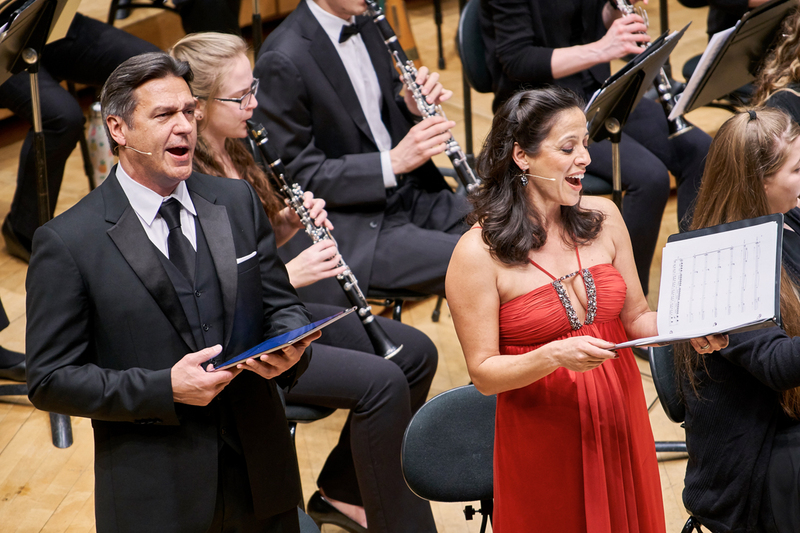 Soprano Yvonne Redman and baritone Nathan Gunn, both members of the U. of I. music faculty, sang the solos at the Chicago concert. DiOrio listened to recordings of their work and wrote music tailored specifically for their voices. “Writing for the two soloists was such a treat because both of them are amazing professional artists who've performed all over the world,” he said. Richard Todd Payne, an Illinois alumnus and a music professor at Missouri State University, will sing the baritone solos at the April concerts. DiOrio’s composition also includes quotations from Brahms’ “A German Requiem” and Symphony No. 1, the latter written beginning in 1867, the same year the U. of I. was founded. The U. of I. provost’s office supported the commission, and the tours to Chicago and New York City were made possible by a donation from School of Music alumna Lynd Corley on behalf of her family and in memory of her late husband, Gene Corley, a College of Engineering alumnus. Editor’s notes: More information about the “Gathering” concerts can be found online at https://music.illinois.edu/gathering or by contacting Jancie Philippus at jlphili2@illinois.edu.